Princeton NJ -- More than a century before Sidney Poitier shared Hollywood's first interracial kiss in ''Guess Who's Coming to Dinner'' and Jimi Hendrix reinvented ''The Star-Spangled Banner'' as an incendiary guitar solo, a fugitive slave named Henry ''Box'' Brown startled audiences with his extraordinary performances. Brown earned his nickname by escaping slavery in 1849 in a wooden crate mailed from Richmond, Va., to Philadelphia in collaboration with a black freeman and a sympathetic white shoemaker. Upon gaining his freedom, Brown toured the free states and England with a panoramic exhibition called ''Mirror of Slavery,'' a moving scroll of scenes that intimately depicted slave life and his own quest for freedom. In the eyes of Daphne Brooks, an assistant professor of English at Princeton who specializes in African-American literature and culture, Brown was a ''multimedia genius'' whose work prefigured the advent of motion pictures -- making him as much of a groundbreaking cultural figure as more renowned black activist-entertainers such as Poitier or Hendrix. He also is among an assortment of unconventional writers, actors and musicians whose work infuses Brooks' research and teaching in English and in the Program in African-American Studies. Building on her own eclectic tastes, Brooks focuses on the evolution of African-American culture and its influence on generations of writers, musicians and performers, both black and white. Since joining the Princeton faculty in 2001 from the University of California-San Diego, Brooks has taught courses on African-American literature and culture, performance studies, critical gender studies and popular music. She recently completed a book on avant-garde black performers of the 19th century and is now writing about the life and music of Jeff Buckley, a white rock musician whose sudden death in 1997 ended a short but acclaimed career. ''She is really in the forefront of her generation of intellectuals who are transforming the study of literature and culture,'' said Valerie Smith, the Woodrow Wilson Professor of Literature and director of the Program in African-American Studies. ''She is a dedicated and meticulous scholar who has done thorough and pathbreaking archival research in 19th-century trans-Atlantic black performance culture. She is also an adroit reader of texts, whether musical, literary or performative,'' Smith said. At the foundation of Brooks' mix of research interests is her lifelong passion for rock music. Coming of age in the San Francisco Bay area as a music fan during the bombastic stadium rock era of the 1970s through the black rock revolution of the late '80s, she was eager to understand the broader socio-cultural context of that music -- insight she often discovered by poring through the pages of magazines such as Rolling Stone and Creem. Such inspiration is seen in Brooks' current book project, ''Jeff Buckley's Grace,'' which will be published by Continuum Books. The book will examine the legacy of the singer-guitarist, who only released one full-length studio album but had amassed a cult following before he drowned at the age of 30. Buckley's music was shaped by a ''wild elixir of discordant musical and cultural influences,'' from Nina Simone and Billie Holliday to Led Zeppelin and Queen to Emily Dickinson and Toni Morrison, Brooks noted. She discovered Buckley's music while in graduate school. ''I was taken by his voice and the eclecticism of his repertoire. I was amazed that this young, stunningly handsome white guy from Southern California could sing like Nina Simone one minute and sound like Robert Plant the next,'' she said. ''He was a figure who embodied and manifested all of that cultural heterogeneity that I saw in myself. There was something about his openness in terms of how he had listened to music and had converted and transformed all of those different sounds of the '70s, '80s and '90s into this very distinct, different kind of music,'' she said. Brooks began writing ''Jeff Buckley's Grace'' after recently completing her first book, ''Bodies in Dissent: Performing Race, Gender and Nation in the Trans-Atlantic Imaginary,'' about black performers of the 19th century. It is slated for publication next year by Duke University Press. ''The book is about these funky, interesting performers and public figures who were performing blackness in ways that were counterintuitive to how dominant culture perceived black people,'' Brooks said. Its cast of characters includes Henry ''Box'' Brown and Adah Isaacs Menken, a ''racially ambiguous'' actress who gained international fame while performing equestrian acts in a flesh-colored body suit. Brooks' interest in innovative 19th-century black performers evolved from her experiences as a music fan in the 1980s, when black hard-rock groups such as Living Colour and Fishbone were becoming increasingly popular with white audiences. At the same time, scholars were digging deeper into African-American cultural archives to explore the roots of popular culture. For Brooks, the opportunities to pursue interdisciplinary research, as well as Smith's decision to return, were huge enticements to join the Princeton faculty. Smith's leadership in the African-American studies program ''ensured a dynamic future for the program and a commitment to encouraging, promoting and developing interdisciplinary research projects and programming,'' Brooks said. ''We have a really exciting group of people who see the value of doing academic work that can both have an impact in the classroom and can stretch out into the community at large,'' she said. 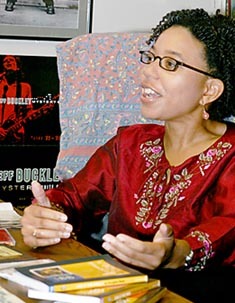 In addition to her academic work, Brooks has found an outlet for her rock criticism at the Experience Music Project museum in Seattle, where former New York Times music critic Ann Powers and former Village Voice music editor Eric Weisbard (of Prince-ton's class of 1988) run the research department. She has presented her work for several years at the museum's annual conference, which draws music journalists, academics, musicians and fans. Eventually, Brooks hopes to publish more of her rock criticism in the mainstream press. She also would like to develop a course on the history of rock criticism and invite critics such as Powers and Greil Marcus, who has been a visiting professor at Prince-ton, to discuss their craft with students.